SPG launched a new promo earlier this week (access my piece here) to celebrate the launch of the new partnership with Virgin Australia’s Velocity program. Now, SPG has quietly changed the Terms and conditions of the promotion without communicating anything to the members that signed up for it. Previously, the number of Starpoints you could earn was unlimited and only maxed at 6,000 bonus points per stay (6-nights). You could have had unlimited number of 2, 4, or 6 nights stays during the promotional period and collected 2,000 bonus Starpoints for every two nights. 2000 Starpoints per two (2) eligible nights will be credited to the member’s account within 4-6 weeks following the close of the promotion. A member can earn up to 6000 Starpoints per stay as a maximum. 2000 Starpoints per two (2) eligible nights will be credited to the member’s account within 4-6 weeks following the close of the promotion. A member can earn up to 6000 Starpoints for this promotion as a maximum. Now, SPG has decided that they won’t offer more than 6,000 Starpoints total during the promotional period, regardless of the number of eligible stays or nights you may have. The email confirmation that you get for registering this promotion still contradicts this T&C’s change. There is still no requirement for being in APAC or having to register for Velocity to take advantage of this bonus Starpoints offer. It is really bad form for SPG trying to sneakily change the T&C’s of the promotion that they have already launched and members have made bookings for. The email confirmation that you get for registering this offer uses the word ALL that clearly communicates that there is no limit on the number of Starpoints you can earn for this offer. SPG should man up and honor the original terms and conditions of this promotion. Bonus Starpoint offer valid only at participating hotels and resorts in Asia Pacific. To view a list of participating properties, visit “>http://www.spg-asiapacific.com/velocity/en/participating.html. Bonus Starpoint Offer is valid for eligible stays completed between February 17, 2014 and May 17, 2014. A minimum stay of two eligible nights is required to qualify. 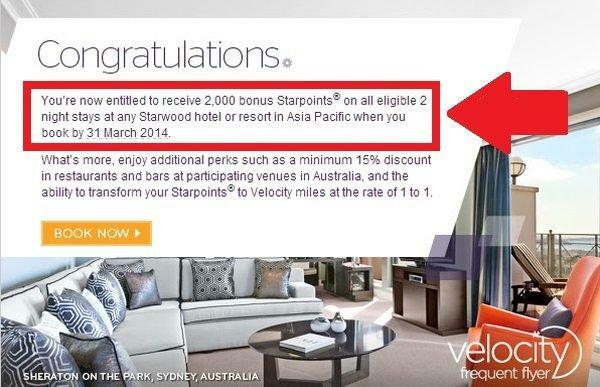 To participate in this Bonus Starpoint offer, Velocity members must register online at www.spg-asiapacific.com/velocity by March 31, 2014 and be a member of the Starwood Preferred Guest (“SPG”) Program. If Velocity member is not a member of the SPG Program, a free membership may be obtained at www.spg.com. An eligible stay is defined as two or more consecutive nights paying a qualifying rate in the same hotel regardless of the number of check-in or check-outs that occur and post to the member’s Starwood Preferred Guest® account. A qualifying rate is any rate that is eligible to earn Starpoints in the Starwood Preferred Guest program as defined in the SPG Terms & Conditions. Starpoints® earned in the SPG program can then be transferred to valid Velocity accounts at the exchange rate of 1 Starpoint = 1 Velocity Point. Member will receive 5,000 bonus Velocity Points for every 20,000 Starpoints transferred to Velocity. Once Starpoints have been transferred to Velocity Program Frequent Flyer, they cannot be returned to the Starwood Preferred Guest account. Subject to applicable laws, Starwood reserves the right to modify or discontinue this offer at any time. Starpoints, SPG, Preferred Guest, Sheraton, Four Points, W Hotels, Aloft, Le Meridien, The Luxury Collection, Element, Westin, St. Regis and their respective logos are the trademarks of Starwood Hotels & Resorts Worldwide, Inc., or its affiliates. To earn and redeem Velocity Points you must be a member. Velocity membership and Points earn and redemption are subject to the Member Terms and Conditions available at www.velocityfrequentflyer.com, as amended from time to time. The Restaurant & Bar discount offer is only valid for Velocity members of the Virgin Australia Program for members of Velocity, the Frequent Flyer Program of Virgin Australia. A valid Velocity membership card is required must be presented at time of purchase to receive these offers. Percentage discount varies by participating restaurant and bar. Please visit “>http://www.spg-asiapacific.com/velocity/en/participating-fnb.html to see applicable discount for each participating restaurant and bar. Discount must be requested in the restaurant at the time of settling the bill, even if applying charges to one’s room; cannot be applied at the front desk. Discount not applicable in conjunction with additional restaurant or hotel specific promotions. Velocity member must be present to receive the discount. Starpoints, SPG, Starwood Preferred Guest, Sheraton, Four Points, W Hotels, Aloft, Le Méridien, The Luxury Collection, Element, Westin, St. Regis and their respective logos are the trademarks of Starwood Hotels & Resorts Worldwide, Inc., or its affiliates.